Getty/Alex EdelmanBernie Sanders has repeatedly criticised Amazon. Amazon responded to Sen. Bernie Sanders in a blog post on its website on Wednesday. Sanders has repeatedly criticised Amazon, using it as an example of the abuses of capitalism. Amazon called Sanders’ claims “inaccurate and misleading” in the post. A direct response from Amazon is rare and may be a big sign that Amazon is trying to repair some of the damage done to its reputation in the past few months. Amazon has just fired back at one of its most vocal critics. The post, on the company’s Day One blog, goes on to tout its pay and benefits, as well as the working conditions in its warehouses – areas that Sanders has repeatedly criticised. Sanders frequently makes an example of Amazon, using high-profile news stories describing poor and strenuous working conditions and pay that Sanders asserts forces employees to be on food stamps, or what is now called the Supplemental Nutrition Assistance Program. Tweets from Sanders’ account frequently portray Amazon as the biggest villain of capitalism, and they often mention the company’s founder and CEO, Jeff Bezos, who as the richest man in the world has been criticised for giving away relatively little in the name of philanthropy. A theme of Sanders’ tweets is Bezos’ extreme wealth compared with what Amazon’s lowest-paid workers make. “While Jeff Bezos’ wealth has increased $US260 million every single day this year, he continues to pay many Amazon employees wages so low that they’re forced to depend on taxpayer-funded programs such as food stamps, Medicaid and public housing to survive,”Sanders tweeted on Friday. 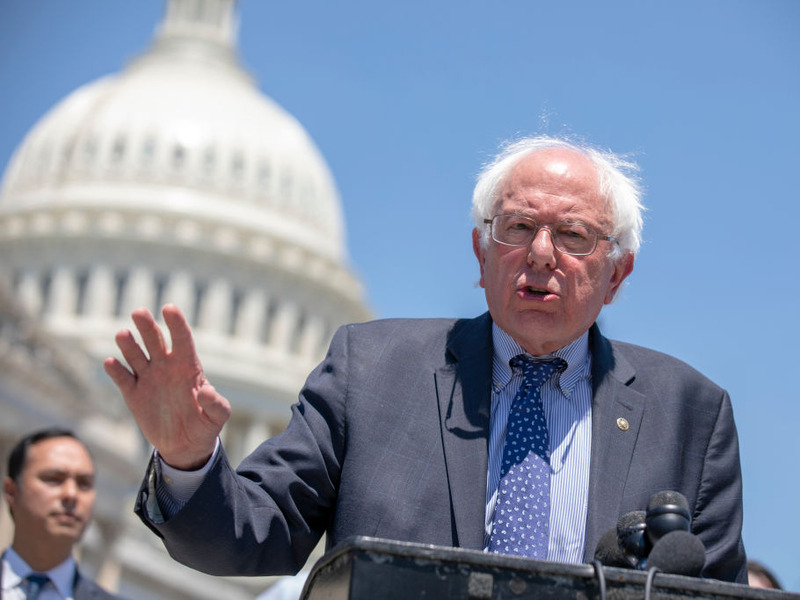 Sanders announced on Friday that he would introduce legislation to the US Senate on September 5 that would impose a 100% tax on government assistance received by workers at companies with more than 500 employees, according to The Washington Post. For example, if an employee draws $US100 from food stamps, that person’s employer would be taxed the same amount. Amazon has previously used Twitter to reply to Sanders’ posts on social media, once inviting the senator to visit a fulfillment center, but it has never gone to the lengths it went to on Wednesday to defend itself. Amazon went on to boast about its benefits and pay for warehouse workers. The stern response to Sanders underscores one of Amazon’s latest endeavours: trying to improve its reputation, which has taken a hit in recent years for the reasons Sanders has enumerated. The response is also hot on the heels of other reputation-management initiatives, like a new program on Twitter where Amazon turns its warehouse workers into “ambassadors” who say nice things about the company online and engage in dialogue with other users who disparage Amazon’s pay or working conditions. Taking both of these initiatives together, it’s clear Amazon is making strides to try to clear its name and is no longer content to sit back and watch as it is criticised by prominent figures.